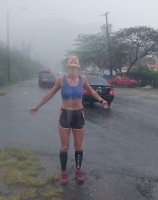 Today we ran ten miles in the pouring rain! I calculated this all wrong... We were not early enough so there was a constant stream of cars... Fortunately the main road has a path that runs by it on both sides. Amy my wonderful PA in the UK, looked up the emotional and psychospiritual connection to knee... In essence it says that knees represent fear of change and fear of moving forward....! Greg has helped me by giving me lots of good advise, exercises and suggesting I ice my knee after I run. It can still take time, we can only resolve when we are ready to resolve, and this is apparent given that I have lived with 'pointy knee' for five weeks before seeking help...! And tomorrow I will come face to face with the re assuring voice of the man at the end of the phone..